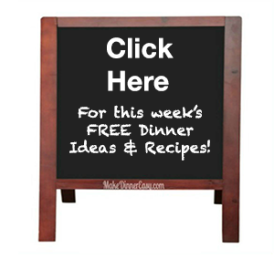 My good friend Sue D.of Graphic Visions is a mom and successful business owner who loves easy and delicious meals. 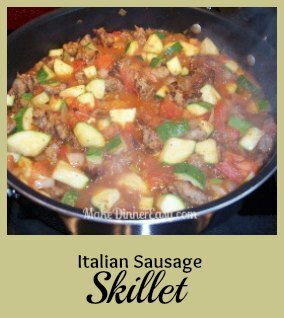 She shared this recipe for Italian Sausage Skillet; I tried it and my family loved it as well. Remove sausage from the casing if necessary and cook fully until browned in a large skillet. Use two spoons to break up the sausage into small pieces as it cooks. Remove from heat, drain off any grease, and blot with paper towels. 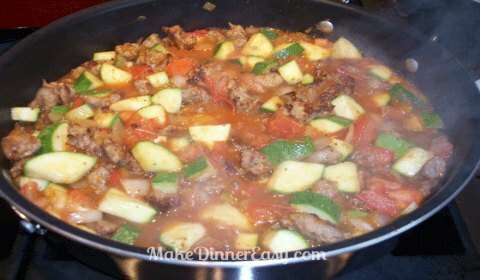 Return to medium heat and add chopped onion, garlic, green pepper, tomatoes, zucchini, and spices. Simmer until vegetable are as tender as you desire. Stir in Parmesan cheese. Place provolone cheese on top and allow to melt. Can be served alone with garlic bread or served over pasta.